When situations demand split-second target acquisition and maximum field of view, mount up the STRIKEFIRE II and shoot-both eyes open. Feature-rich, versatile and reliable, the STRIKEFIRE II is a great choice for shooters who want a quality red dot sight, but don't want to break the bank. 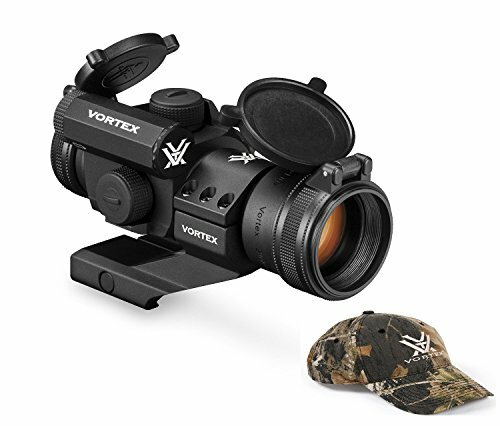 Features sleek rear-facing controls for power on/off and easy adjustment of ten dot intensity levels, lowest two settings are night-vision compatible. Automatically returns to the last dot intensity used when powered up. The 30mm aluminum alloy chassis provides extra-high recoil rating and is waterproof and fogproof. Strike fast. Unlimited eye relief, 6-hour auto-shutdown feature which maximizes battery life. CR2 Battery Included. 30mm one-piece tube. Parallax-free design allows for rapid shooting with both eyes open - no parallax shooting error. Includes Cantilever Mount / Features: Red/Green Dot Sight 4 MOA Dot. Rear facing Red/Green Light Switch. Lowest two settings are night-vision compatible, 10 brightness settings total. Waterproof optic is O-ring sealed to prevent moisture, dust and debris from getting inside. Nitrogen purged to inhibit internal fogging.